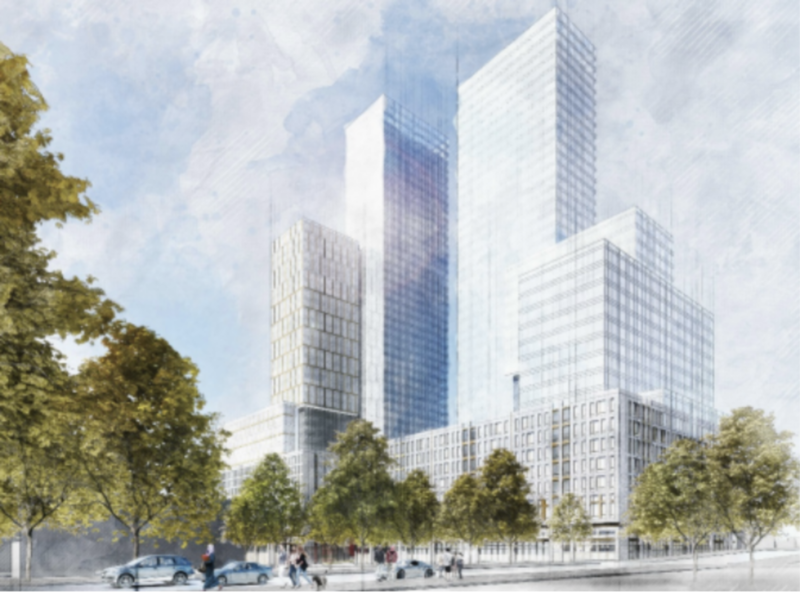 A case in point is the 39-story towers project proposed for 960 Franklin Avenue, a block or so from the Brooklyn Botanic Garden. If you Google this project you will see article after article – including Ginia Bellafante’s recent piece in the Times – with variations on the following statement: “containing 1,578 units of housing, half of which would be affordable” (Gothamist 2/21/19). What are all those journalists talking about when they call those apartments “affordable”? Problem #1: A closer look reveals that the plan for the Franklin towers includes misleading statements and statistical smoke and mirrors about who will be able to live there. The project will have the following “affordable” units: 60% of the apartments will be for those who earn at or below 80% of Area Median Income (AMI), 20% for those making 100% of that income, and 20% for those making 120% of that income. The first problem is that the definition of “AMI” includes income from the wealthier NY suburbs: for a household of three people, roughly the average size of a household in NYC, the AMI is $93,900. But the median household income in this district according to census data is $51,072! And the median income in the city, without the rich suburbs, is still only $61,000, a far cry from $93,900. A more accurate statement would be this: a majority of the apartments being touted by the developer and media as “affordable” are actually not affordable to the average neighborhood resident, average New Yorker, and of course not to the over 40% of New Yorkers who have very low and extremely low incomes, including the homeless. Problem #2: The Housing and Urban Development agency (HUD) defines affordability to mean spending no more than 30% of your household’s income on rent. The use of the term “affordable” to include apartments priced for those making 100% or more of AMI is at best misleading and at worst dishonest. For the three-person household mentioned above, making $93,900, a 2 bedroom apartment would rent for $2,289. Most New Yorkers would not consider such an apartment affordable and it’s highly misleading and of dubious value to count apartments like these in the affordable column under NYC’s housing plan, while precious few apartments are being created for those who really need them and don’t have the options available to a household making nearly $100,000. Not to mention including those for AMI’s of 120% and higher! Problem #3: We should not inject large numbers of market rate or near market rate apartments into neighborhoods that already have a good stock of truly affordable apartments! Time and again the result has been gentrification and displacement – meaning, of course, that many of the existing affordable apartments along with their residents will be lost and 960 Franklin Ave is a perfect example of this. With more than 1,500 proposed apartments, well over 1,000 will be market rate or near market rate apartments. The scale of this development will substantially alter the market in this area. We need look no further than neighborhoods of Northern Brooklyn to see the impact such a large influx of market-rate apartments has – much higher rents, loss of rent-regulated units due to market pressure, displacement of lower-income residents, usually people of color, as well as small businesses, and a net reduction in affordable apartments in the long run, as the only apartments left that will be affordable will be the permanently affordable ones–a small minority of the total housing stock. And guess what happens to these people when all the stores and shops in their neighborhood are catering to the majority of new, wealthier residents? This “affordable housing scam” needs to stop now. We need an investigation by an independent agency – Public Advocate or City Comptroller for example, with the goal of informing the public on the outcomes of the Mayor’s housing plan. How many total units have been built and are in the pipeline? How many of these are market rate or near market rate (80% of Area Median Income (AMI) and higher)? How many of the apartments being called “affordable” are truly affordable for the average New York City resident? For very low or extremely low-income residents? For the homeless? We need an independent evaluation of this massive undertaking that has turned our city upside down over the last ten years and counting and transformed forever many of our neighborhoods. We also desperately need a common understanding of what the term “affordable” means when applied to housing. Human-scale NYC is a non-profit born of a coalition of over 100 neighborhood and community-based groups. We are not opposed to development anywhere in the city. What we are opposed to is out of scale development and development that purports to deliver affordable housing, but really doesn’t. This situation is critically important to the future of our city and as citizens, we need transparency and we need accurate and truthful information so that we can make decisions on what kind of a city we want to live in and who can best help to make that happen. So if you’re reading this Mr. Williams or Mr. Stringer, please start the investigations! One of the trickier issues! The real-estate biz is the #1 campaign funder in NY! BIG PIC needs to be addressed… and the rent is too damn high! I have to disagree with #3 and the worry of “Gentrification” first off what is Gentrification? It means Better schools, more city services, better quality of life, safer neighborhoods, economic development and opportunity. Also, under Mandatory Inclusionary Housing any New Affordable housing built Must be “Permanently Affordable” so people wont fet displaced. The old way of doing housing just creates “Concentrated Poverty” and does not economically diversify a community giving people access to better healthcare, schools, transportation and opportunity. The need to balance incomes ro ensure the long term sustainability of the neighborhood is vital. Thank you for pointing out what a scam De Blasio’s affordable housing policy is! Deblasio was one of the worst council members, a terrible Public Advocate. People are fools to work for him and have voted for him. HPD needs to be overhauled from the top to the bottom when it comes to their alleged affordable housing initiatives that don’t exist. The problem is there is NO diversity in housing. Nothing is being built for working middle income people. CIty, gov’t and state employees generally don’t make $100,000 a year or even close to it. And let’s not talk about what they bring home after taxes. That’s a joke. They need to develop another concept like MItchell Lama; call it what you want, how about REAL affordable housing. People have a right to live decently. Develop rules and regulations for affordable housing and stick to it. But what is happening now is a tragedy to the people who have lived in and supported this city for decades. Our city government has let us down tremendously and concentrated on appeasing rich Europeans. As far as concentrated poverty goes, whose fault is that? Where are these people who earn minimum wage supposed to go? Believe it or not there will always be poor people and they are just as valuable.